I won the giveaway over at Glitter and Gingham. The giveaway was a $50 gift card to J.Crew. I cannot tell you how excited I was when I won. Since, I had my eye on these at J.Crew. As soon as I won, I took it as a sign that I was meant to get these pearls. Without further ado, here are my pearls. LOVE THEM!! I haven't stopped wearing them!! Much thanks to Shelby over at Glitter and Gingham for having such a fab giveaway. Make sure you check out Glitter and Gingham. Shelby has fantastic style and I love looking at her Outfit of the Day! She inspires me to be more creative with my attire. Her blog is one of my daily reads. Totally check out her blog, you won't be disappointed. What do you think of my new necklace? oh so pretty!!!! lucky you!!!! 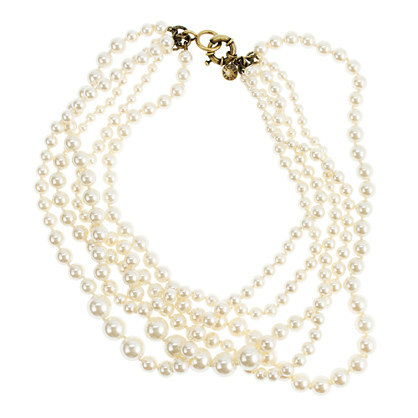 I triple love these pearls!!!! I would wear them all the time too. Congratulations on winning, such a great prize!